Download the Compliance Checklist Template that has been designed to examine even the basic compliance expectations. 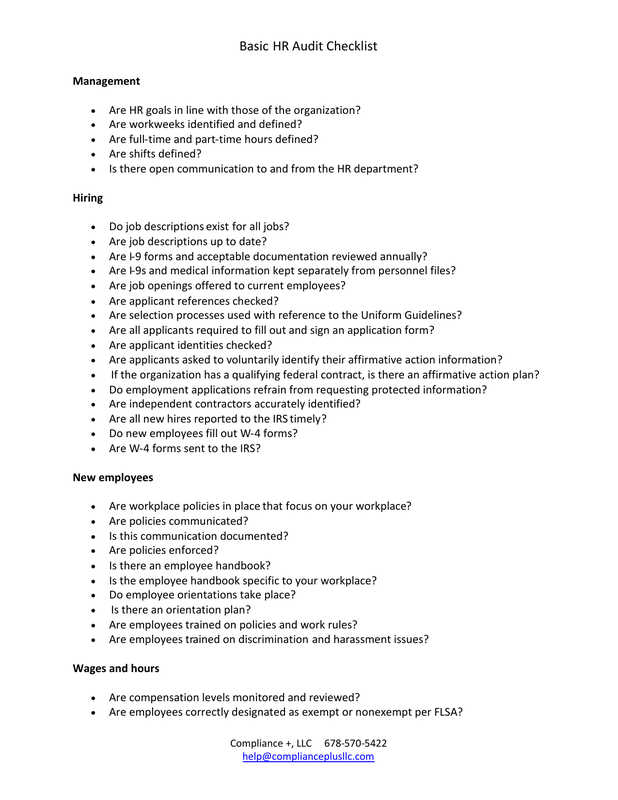 The HR manager would read through all of the questions in all of the categories. Depending upon how the questions are honestly answered the HR manager will know what changes must be made to remain in compliance. Be certain to note those areas that may not be in compliance so that they may be properly and immediately addressed. This section will ask questions with regard to compensation level monitoring, exempt/nonexempt employees, time documentation and much more. This section will ask about benefits and notices with regard to information about COBRA, FLMA act, are plan documents in compliance with ERISA? The final section will address current personnel files. labor poster placement, updated posters and required employee document retention.